Liquid Planner keeps improving their usability. I got this update from them today.. In case you didn't see my previous post on them, Liquidplanner is the most sophisticated and thought out web-based project management system that has a potential to be MS Project replacement. 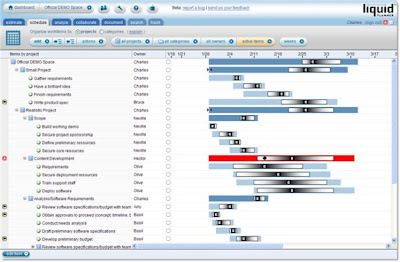 If you're a seasoned LiquidPlanner user, you've probably been pining for these features. If you're new to the club, you just might forget you're working in a web browser. In either case, enjoy! Multi-Select - It's finally here! You can now select multiple items and edit, move, or delete them -- and more. Not only does this speed initial project setup, but multi-select improves the speed of day-to-day operations by an order of magnitude. Email Integration - It's easier than ever to add tasks with our new email integration feature. Enter the task name, owner, and estimate in the subject line of your email and send it to a custom LiquidPlanner email address. Attachments and images will be captured in the collaborate tab. Give it a try! 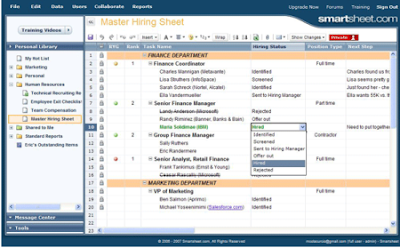 Right-Click - Right-click on any item to access to the most common operations in LiquidPlanner, like adding or deleting items, filtering your view, and printing your schedule. We also added new ways to watch items and rolled out a big batch of improvements to the scheduling engine, printing, virtual members, and more. New and improved sample projects provide insight into optimal workspace organization. Browse around and check out the new features. As always, we appreciate your feedback. Do you know your aaS's? Wondering what all those announcements about cloud computing are all about and how they relate to you? 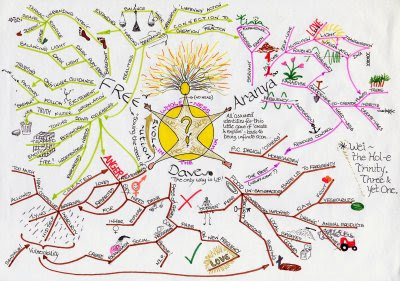 Getting lost in the jargon? MS Azure, EC2, S3, Grid, IaaS, PaaS, SaaS? Don’t worry, you’re not alone! IT industry is notorious for making up acronyms and focusing on themselves when explaining things. I’m getting ready to review some new products that fall into some of the new categories, so wanted to do a post putting things in prospective. IaaS stands for Infrastructure-as-a-Service. It used to be that to build a web application, the designers needed to worry about which server model to go with (co-location, managed, etc), which hosting provider to go with (affecting the uptime, system reliability and physical security), setting up and maintaining the server software (good Linux system administrators are extremely hard to find), worry about scaling the system past one server (database replication, load balancing, and bunch of other nasty technical stuff). IaaS solves most of those issues by providing a virtual server environment that is automatically scaled and kept up to date. This is a big load off the application provider shoulders, allowing them to focus on the application itself. Solutions in that category are represented by Amazon EC2 (virtual servers), S3 (scalable storage), SimpleDB (scalable database), Rackspace’s Mosso, and newly announced Microsoft Azure. PaaS stands for Platform-as-a-Service and takes the concept one step further. In addition to providing the basic building blocks (servers, database, storage), platform-as-a-service provides a ready-to-use application environment a developer can use to build their applications. Similar to Microsoft Access and Visual Basic for Applications, by using PaaS, developers can raise their development up a level, creating data collection forms, reports, lists, workflows, and various other applications without as much as installing an application. This creates leverage from the reuse and speed of development angles. Examples of PaaS are SalesForce’s Force, Zoho’s Creator, LongJump, and a few other interesting new entrants such as Wolf Frameworks. I believe this category is the one to watch for the innovations with largest leverage. Finally, SaaS is an older category that includes any web-based, ready-to-use application like most of the things I've reviewed so far on this blog: CRM, project management, wiki, PIM, or any combination thereof. 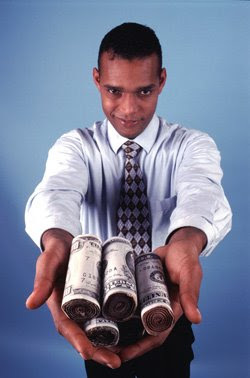 37 Signals announced a new feature, Deals - which is a welcome addition to an otherwise good "Service CRM" alternative. 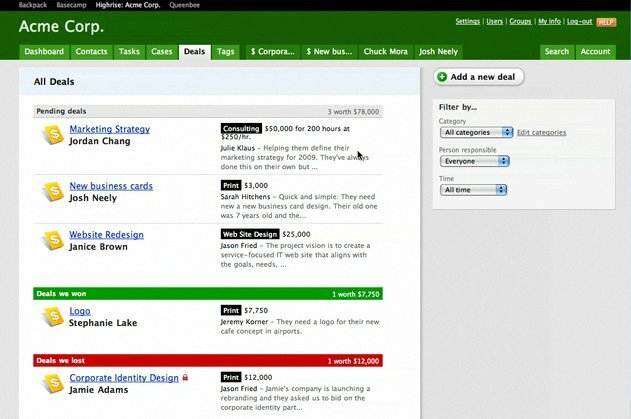 Now, deals (or opportunities as they are called in traditional CRM's) are nothing new, but 37 Signal's Highrise CRM does it with style (which is what sets them apart from the traditional CRM's in the first place). This got me thinking about how exactly does style (usability) affect the technology adoption. I haven't seen much research on this, really; but it strikes me as a critical component, although I've seen systems that were adopted widely where the interface was horrendous. Care to weight in on that? How important is style? Does it become more important as the number of choices for particular functionality increase? (thinking Apple).. Meanwhile I'll dig around for some scholarly papers. Gears for Google Docs - Are we there yet? Google announced Gears support for Google Docs today. If you don't know what Google Gears are - it's a technology that makes web applications work when you're not online. This blog is about Office 2.0, which in turn is about web applications replacing their desktop predecessors. Office Applications(writer, spreadsheet, and presentations) are some of the most critical applications that people use in their daily work-related activities. Google Docs have been available for a while but enjoyed less than stellar adoption, despite their rich feature set. One of the obstacles on the way to adoption was the fact that you couldn't open Google Docs when not online (nowadays it means mostly you're on a plane, at a hotel or other public location where they want to extort $9.95 for a connection, or out and about). Google Gears helps overcome this obstacle by providing access to the files while off-line. Google Gears support for Google Docs might be that last drop, the catalyst, that will push a lot of people off the fence when it comes to switching to the Google Docs as their primary Office applications. P.S. Take a look at my other post about running the application in its own window.. Gears applications require the application to be already loaded when you go off-line, so working with them in a separate desktop window rather than the browser helps a lot. P.P.S. 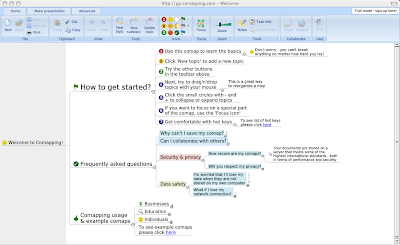 Google Docs is not the only option when it comes to the Gears-supported Office Suite. Zoho (my favorite office 2.0 company) has had Gears supported office suite for several months now. I don't know about you, but running web applications in the browser tabs is something that I find less than convenient, even irritating at times. Browser tabbed user interface is great for reading news, articles, and performing an occasional shopping transaction. But when it comes time to using it as a shell for an application, all those extra toolbars and buttons start to get in the way real quick. So lately I've been toying with repackaging the web apps as Windows apps. 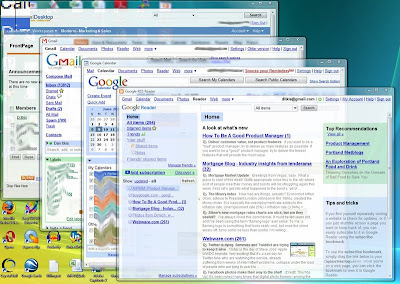 Benefits include being able to run each application as a separate process (if one crashes, you don't have to restart the rest), being able to minimize and restore the windows from Windows tray panel (instead of having one browser window for everything), and ability to position the windows independently from each other. Here are a few of these shells, feel free to try them out and let me know what you think. I for one can't imagine going back to not using them anymore..
Business people have been waiting for this moment for a long time – the time when they wouldn’t have to rely on IT people to tell them what’s possible, what’s not, and invariably a “we’re booked up 1 year ahead of time” line.. That’s why when Salesforce.com and a few other hosted application providers appeared on the scene, they enjoyed a healthy appetite from the business crowd. While Salesforce.com started as a Sales Automation application (as the name implies), they have been gradually morphing into a “platform” (a common database for various business applications). they take business logic seriously. I’m talking about the stuff that makes the businesses run once the data is collected. Most CRMs (especially early on) concentrated mainly on collecting the data, but the real value comes from being able to use this data to power the business systems and processes. Let’s talk about #3 in a little more detail. You’re a customer service manager and you want to implement a process by which if the customer’s issue is not resolved to their satisfaction within 8 hours, it gets escalated to the next tier rep, and if it’s past 36 hours, it gets escalated to you. Or you’re a sales manager and you’ve just sent out a mass mailing about new product launch and you want your staff to focus only on those accounts that just spent more then 3 minutes reading through the literature on your web site. How do you do that? That’s what LongJump’s workflows allow you to do, and with a nice graphical drag-n-drop interface to boot. This is a very powerful stuff! To be clear, LongJump is not the only ones tackling the problem from the generic hosted database platform side, there are couple other interesting contenders that have been on my radar – CogHead is one, and QuickBase is another, however so far I like LongJump the best out of the trio. But what about SalesForce you may wonder, are they sleeping at the wheel? Not exactly.. as I mentioned before, they are making efforts to transition into the ‘everything database platform’, however I find their model of charging for the basic service and letting 3rd parties develop their own apps for business logic too complicated and expensive. LongJump charges 19.95 per user per month vs SalesForce’s $65 + 3rd party add-ons. Bottom line, I’d like to see a serious competitor to SalesForce’s almost-monopoly (sorry NetSuite) out there, so I’m rooting for LongJump. A bit of a side note.. While I think what LongJump and others are doing at providing a unified database platform that specific applications can be written to, providing complete unity of the data, I’m not yet sure how something like this is going to play out organizationally. Applications like this to be constructed correctly do involve quite a bit of system analysis, information system principles awareness and perhaps a central body to oversee the web of efforts that may come from different corners of organization. Having said that I’m not sure that the current separation of IT and Business Units is compatible with a new breed of applications like this. Perhaps, the solution would be to have a dedicated IT or otherwise technically inclined personnel attached to a Business Unit and a central body that oversees that approach, kind of like PMO (project mgmt office) – it would have to be lean enough and lenient enough though to where it doesn’t defeat the purpose of having this application development democratization.. more on that later perhaps..